Watching all of these #ALSIceBucketChallenge is bittersweet. It makes me so happy that so many people around the world now know what ALS is, because many people had no idea before this challenge went viral. Plus watching videos of people dumping ice water on their heads is pretty funny, so how could I not watch it? ….On the other hand, it has made me tear up because it makes me miss my Dad more and more. Heck, he is always on my mind anyway. I know he is proud of me and always here in spirit, but gosh, I’d love for him to just come out of the clouds above me and give me a huge hug right now! …..ALS takes precious lives, and really challenges their loved ones, so I ask for all of my friends and people worldwide, please take the #ALSIceBucketChallenge. It’s for a good cause! 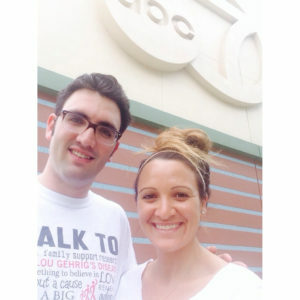 Never Give Up finding a cure for ALS! What is ALS? 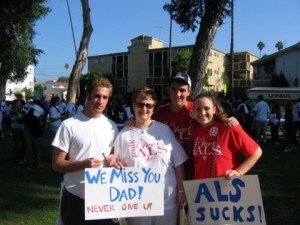 ALS stands for: Amyotrophic Lateral Sclerosis. It is also known as Lou Gehrig’s Disease, or Motor Neurone Disease. It robs a person of their speech, movement of their hands and feet, breathing and eating abilities. However, the brain stays intact. I was just seen on ABC7 doing the ALS Ice Bucket Challenge with Daniel Scott Rozzen and Elex Michaelson! See the video here and read the story. I nominate Jordan Stewart and the San Jose Earthquakes, The Ellen DeGeneres Show, Brandon Mitchell, Teza McKenna, Jamie Lynn Franzen, Alex Novak with the Clippers, Hannah Cornett, and Lindsay Tredent Mauch (from Fit & Awesome) to complete the ALS Ice Bucket Challenge within 24 hours or donate $100 to The ALS Association. It’s been over 10 years since we lost my Father, time sure does fly! We miss you David Rozzen! I will love you always and forever, Dad! I challenged Jordan Stewart from the San Jose Earthquakes MLS soccer team, and he accepted. He did this challenge with: Chris Wondolowski, Tommy Thompson, Shaun Francis, JJ Koval, Billy Knutsen, and JB Pierazzi. I’m so stoked! Thanks again guys, your support is much appreciated! You can view the write up here.We also made ABC7 news, and for now here is the video link here. Additionally we were in the San Jose Mercury News and the Marin Independent Journal. What’s my link to ALS? 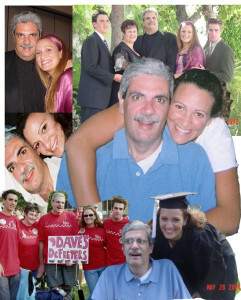 My father, David Rozzen, was diagnosed with Bulbar Onset ALS in June 2002. Within about 4-6 weeks after diagnosis his speech was completely slurred, sounding like a young child trying to speak. Eventually the use of his arms and legs deteriorated and about a year later was totally confined to a wheel chair. My Dad always kept a positive attitude and felt a cure would be found during his illness. Dad passed away in June 2004. After my Fathers passing I wanted to continue his legacy, and carry on his strength and courage fighting for a cure for ALS. 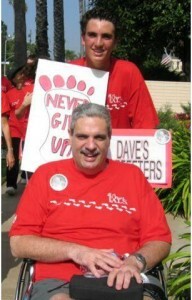 He had the “Never Give Up” attitude and hope that a cure would be found while he was fighting his battle. So, I created the NEVER GIVE UP wristband campaign to raise funds to help raise funds and ALS awareness, to help all those afflicted with this disease. Since 2004 we have raised over $6 million for ALS patient services and research. I hope one day soon a cure is found! Thank you all for your generous support! Also, one of my best friends, Jamie Franzen accepted the challenge and was joined by two of her students. They live in Lander, Wyoming. Thanks for your support girls! Love ya! Post by Jamie Lynn Franzen.